Since 1985, Gary Rohrbach has devised audio and video adaptations including the design, build, install and service of: master antenna systems for hotel/motel chains; Pro Audio systems for retail spaces (including super-sized government retail settings), Commercial office properties, Casinos and even outdoor concert venues. Additionally, Gary has worked as a dealer with DirecTV for well over 13 years. Currently, Gary owns and operates TechNet Communications, LLC which handles a wide variety of low-voltage projects. By building relationships with project managers, general contractors and business owners and then listening to what they want, Gary and his staff present clients with the best options for their dollar. Each quote is custom made. Clients are offered as much free education as they would like on their new product(s). Gary does a great deal of troubleshooting with the client over the phone, helping to keep service calls to a minimum. When a service call is necessary, the entire system is balanced and repaired while onsite – not just a remove and replace of the troubled part. TechNet Communications prides itself on experience, innovation, and accessibility. Along with Gary’s technical prowess, his tough negotiating skills ensure clients get the very best prices on materials and a real person to answer questions. Gary and his group at TechNet work hard to deliver solutions that work for every customer. From system design to product installation, TechNet is the clear choice for your multi-media needs. How many times can you call in a service problem and talk to the very same guy(s) who installed the system and who know how to troubleshoot with you over the phone? Gary Rohrbach (TechNet) has been serving the lodging industry for better than 20 years. During that time, we’ve learned that guests expect an upscale TV with great pictures showing channels they normally watch at home - even when they’re at a beautiful resort. With the flood of electronic devices guests use, TechNet can make suggestions ranging from satellite TV (we’ve offered DirecTV since 1996) to more complex medias/entertainment. To make sure things go smoothly during your installation, our crew remains on-site to answer questions and handle any conflicts that come up, thus minimizing any stress to the staff and customers. Some companies assign “representatives” to hotels to arrange a service group if something goes wrong. They usually don’t know too much about what could be wrong while you may have customers complaining or even walking out. If you call us, you can usually talk to the same guy(s) who installed your system. This kind of accessibility is invaluable in saving time and keeping our customers happy. TechNet has been serving the lodging industry for over 25 years and in that time we’ve learned that lodging customers love a TV with clear pictures and channels they see at home. We offer experienced recommendations for channel line-up, the package that will best serve the property and economical ways to stay competitive. During installation, we stay on-site to ensure a smooth transition that minimizes stress to staff and customers. Gary Rohrbach has been a DirecTV Dealer specializing in Lodging and Commercial properties since approximately 1996. TechNet can deliver high definition content to lodging customers, nursing homes, dormitories, government entities and the private business sector. We work with several companies to provide options for in-room entertainment services geared specifically to the property’s needs, some of which can be installed as revenue streams for the hotel. TechNet can create an information channel so customers have details about meetings, events or weddings held in the hotel, encouraging guests to eat, shop and recreate on-site. 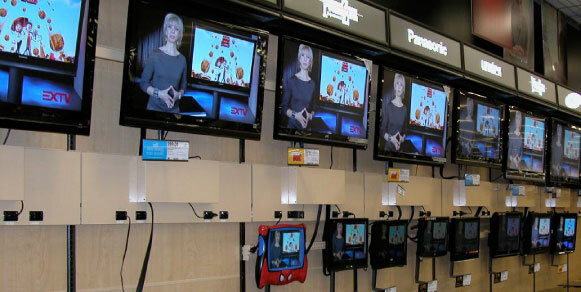 We can build talking video walls for conventions or concerts (this option is popular in hotels that are hosting conventions), in-store promotions, weddings and memorials. They can also be used anywhere that information needs to grab someone’s attention. © 2010 TechNet Communications. All Rights Reserved.